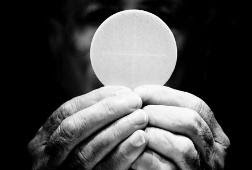 The word Eucharist, in Greek, means Thanksgiving. A Happy and Blessed Thanksgiving to all of you and your families. What a perfect post for today, Michael :) Happy Thanksgiving!! The Greeks got it right. Yes, we were on the same wavelength! A God-incidence! Wow Michael, in this case less is definately MORE! Hi Michael, in yesterday's post, I linked back to one of your post's from the CCB. Hope that was ok? May we all give thanks in Christ giving himself to us. Thank you for the Thanksgiving wishes everyone!